He came by early this morning. As he had done a number of times during the last two months. 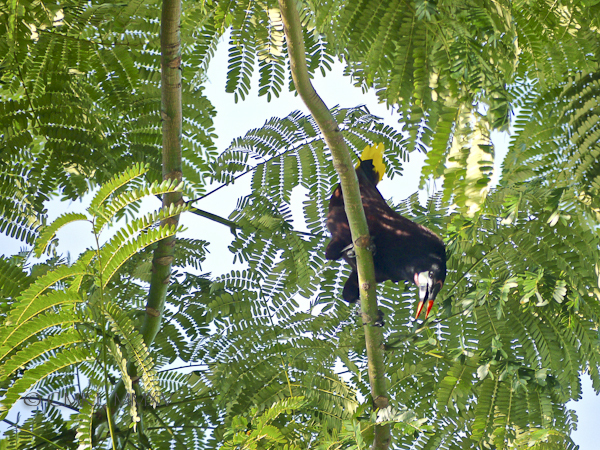 He settled on a branch of our gigantic yellow jacaranda (Schizolobium parahyba), called ‘El Gallinazo’ (chicken-footed: the shallow root system can look like bird feet). Also in 2014, as seen from the street against the front of our house for size reference! Well hidden as he was in the bright green shimmery fuzzy foliage typical for Fabaceae, I had to follow the sound of his cries to find him. 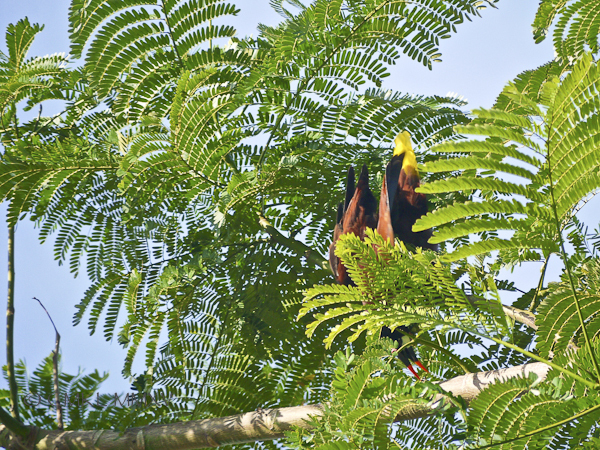 Training the lens toward the oropendola this morning, I was rewarded with a few snapshots showing a solitary male practicing his courting routine. As you can see in the picture above, he likes to hang out near a clump of dried grasses, which may trigger his display behavior. 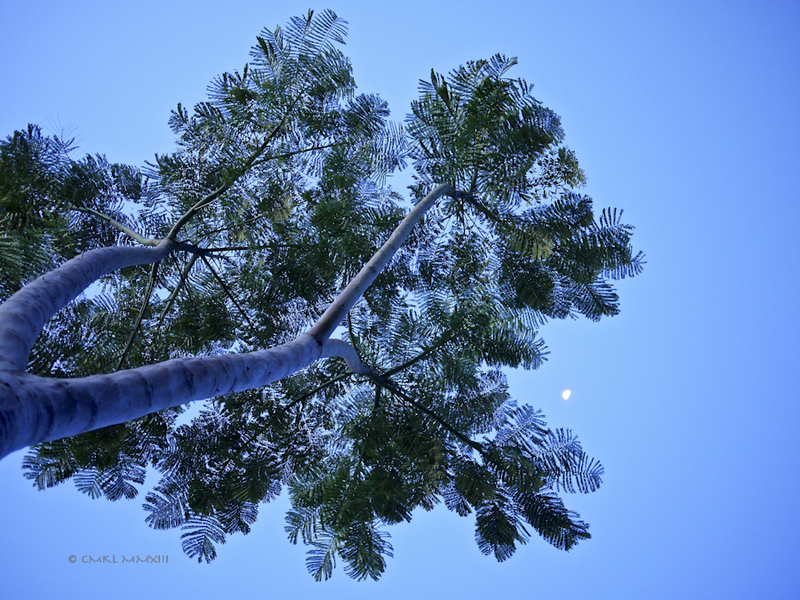 The grass could have been placed there by a female oropendola in an attempt to weave a nest. 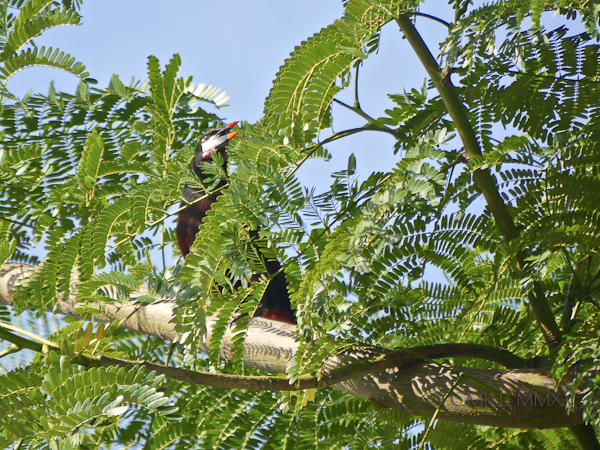 The long and skinny oropendola nest-pouches are shaped like Christmas stockings and an individual tree may be overloaded with several dozen nests of a breeding colony. Usually, only one or maybe two dominant males sire the entire colony’s offspring. 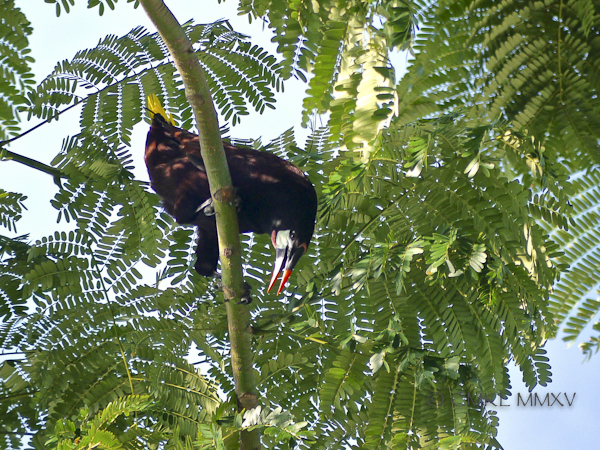 In this very brief video clip, you can see a palm decorated with an abundance of oropendola nests. It used to be down the road from us. 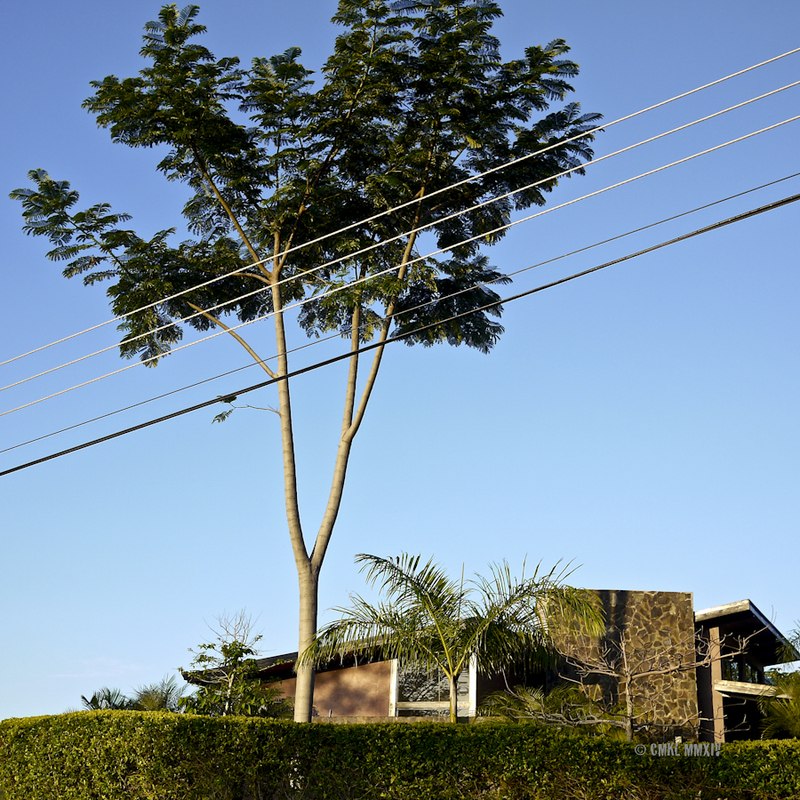 Sadly the palm has since been cut down when the pasture was subdivided into building plots. None sold as far as I know. 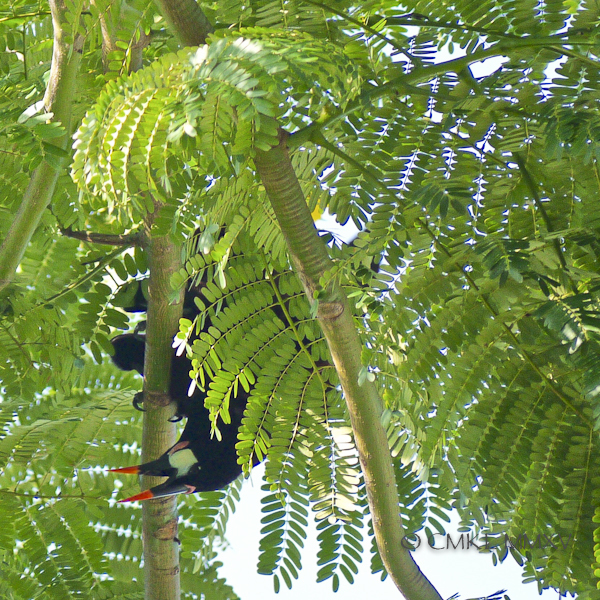 After a while, our morning visitor moved to a different branch where I could observe his display behavior a little better. 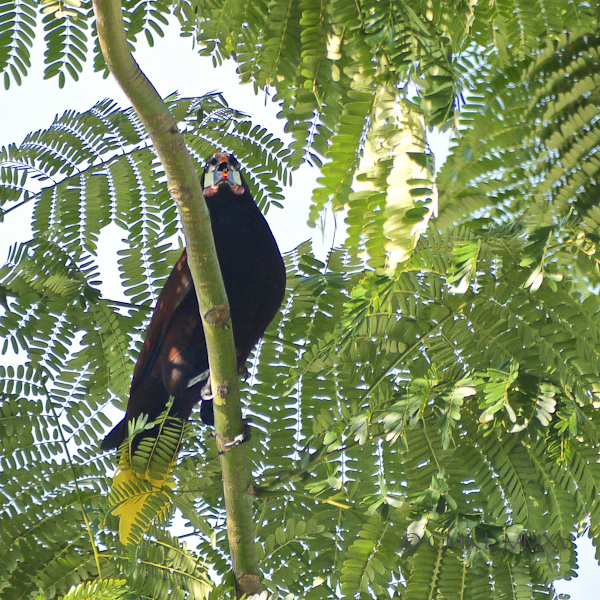 In order to understand how easy it is to identify oropendolas by their vocalization, you have to listen to their songs just once and all will be clear. 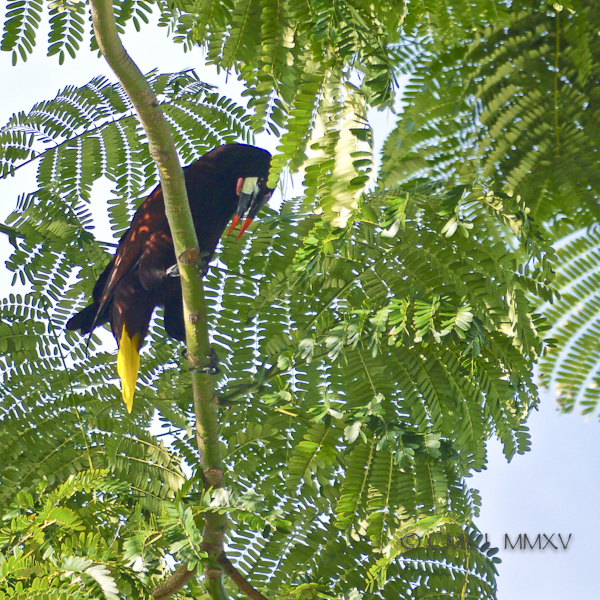 I came across the perfect introduction to the Montezuma oropendola songbook online. It includes three spectrograms, song descriptions and additional information, all of it collected and verified by professor Daniel J. Mennill of the University of Windsor, Windsor, Ontario, CA. 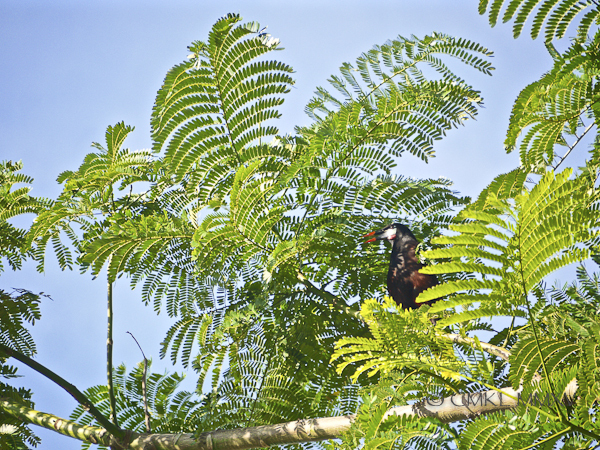 He and his lab have done extensive field studies of bird communication in the Área de Conservación Guanacaste, CR and the Yucatan, Mexico. Check out the crazy Montezuma songs!! 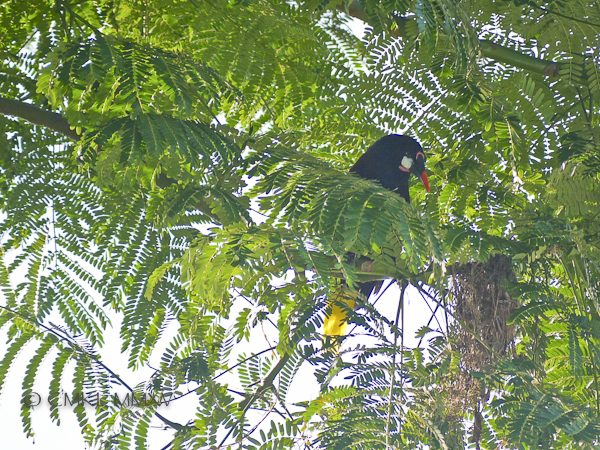 Oropendolas sport a russet colored rump, while the black head is decorated with Marilyn-Monroe-lipstick markings on the beak tips, flanked by pink mutton-chop wattle à Kaiser Wilhelm under delicate baby blue bare-skinned cheeks, that’s our somber blackbird. 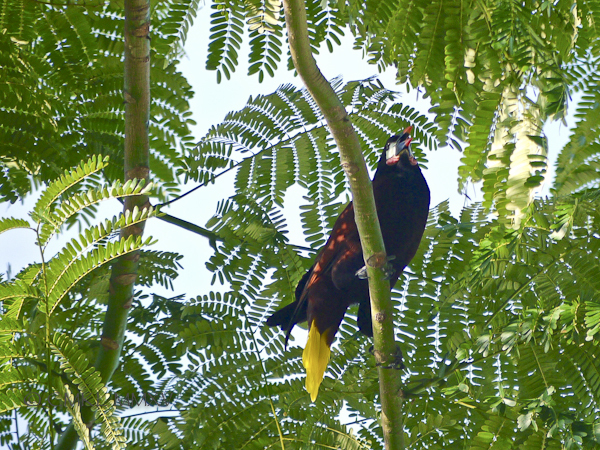 His yellow tail feathers may have inspired the name ‘golden’ pendulum, presumably together with the pendulum shaped nests. As Mr. Montezuma launches into his song with the funky firecracker finish, he doesn’t just sit there. Instead, he hurls himself forward and downward as if to through himself head first off his perch at the feet of his inamorata. In fact, sometimes on overeager bird does lose his grip. 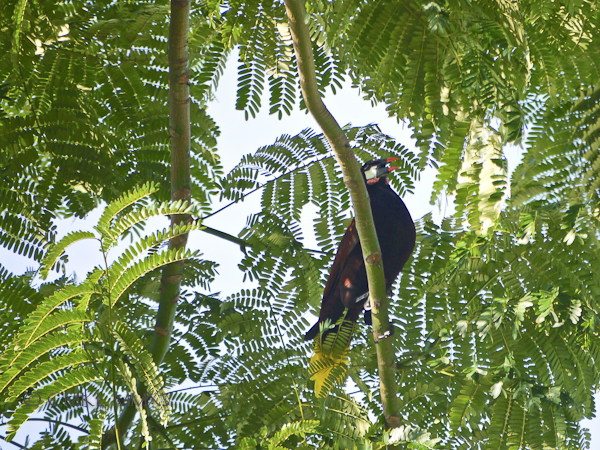 And moving ever deeper into the foliage, the bowing and calling continued for some time. 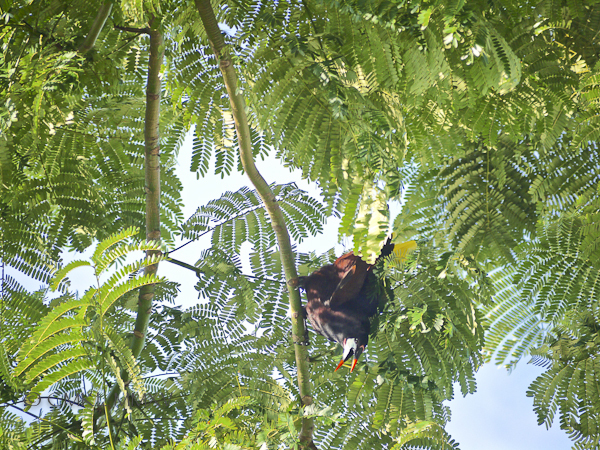 Until a secret signal prompted a swift jacaranda evacuation. 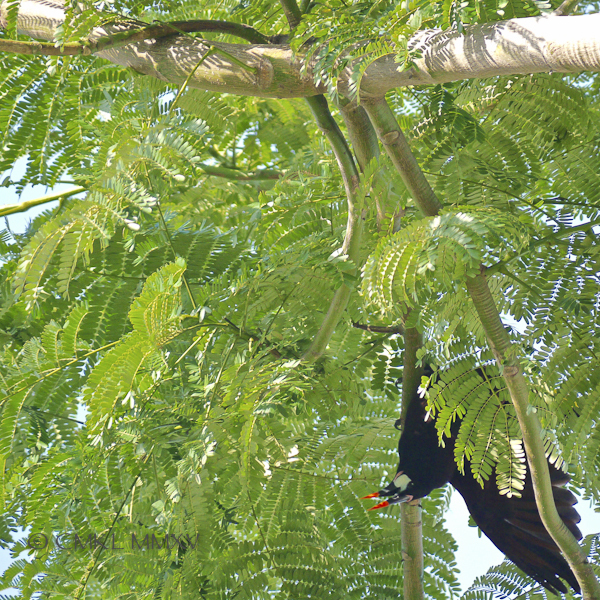 I have repeatedly observed a solitary bird practicing his bowing display in our jacaranda and in two large guanacaste trees across the street and wondered why it would bother without an audience. Reading that Psarocolius montezuma are polygynous breeders, I now postulate that the ladies in the colony elect their champion by virtue of the most enthusiastic execution of bowing and crackling. Thus, hermitic practice sessions in my front garden may lead to a genetic advantage. I just must admit I thought this post would be about violinists or archery.